The French have scored a diplomatic coup by reversing the order of proceedings in such summits. Beginning with Rio de Janeiro in 1992, national leaders arrive at the end of the summit to ratify what negotiators have painstakingly thrashed out. In Paris, they are descending on the very first day on Monday to announce a Paris accord, committing negotiators to a fait accompli. Senior journalist Darryl D’Monte reports exclusively for Rediff.com from Paris. While strict security around the venue of the United Nations climate change summit beginning in Paris on Monday has thwarted what was planned over the weekend as the world’s biggest assembly of humans in protest ever, demonstrations have been held in other cities around the world to focus on this unprecedented global threat. 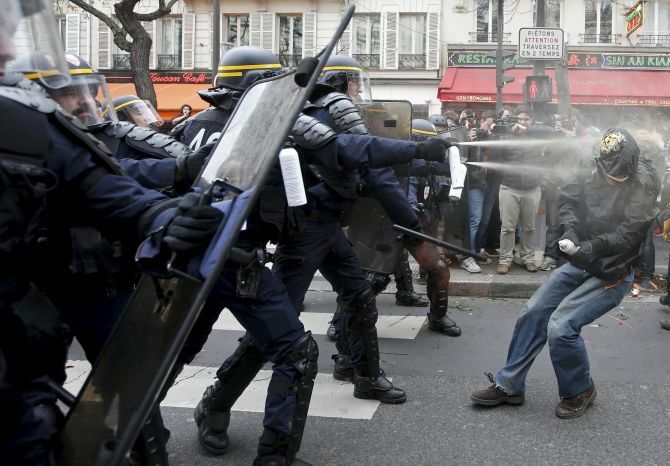 Around 24 activists have been put under house arrest by the French police. Demonstrators have objected to the government’s resort to such high-handed measures due to the heightened concerns following the terrorist attacks, pointing out that football matches and other big assemblies of people haven’t been similarly targeted. There were protests across the Pacific and Asia, with marches in New Zealand, Fiji, Japan, Bangladesh, the Philippines, Egypt, Cameroon and South Africa. In Johannesburg, a city built on coal fields, protesters carried banners reading ‘Coal kills’. According to Greenpeace, marches have been held in several European capitals, including Berlin, Madrid and Rome. There were marches in Kampala, Seoul and Kiev. As many as 60,000 people marched in Melbourne, in the largest-ever climate protest in Australia -- ironically in a country whose government has backtracked on its commitment to curb greenhouse gas emissions. Campaigner Vandana Shiva was among those in Paris who defied the blanket ban on demonstrations. Protesters will instead hold a day of civil disobedience on December 12, following the conclusion of the summit the previous day. 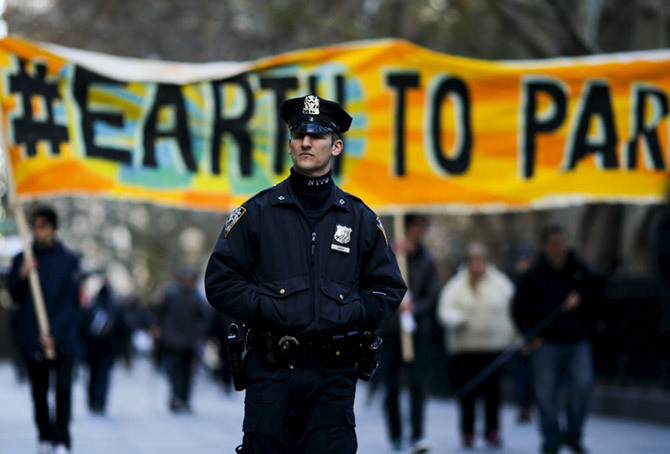 Image: A New York police officer keeps an eye on protesters while they take part in a protest about climate change around New York City Hall at lower Manhattan, New York, on November 29, 2015, a day before the start of the Paris Climate Change Conference. Photograph: Eduardo Munoz/Reuters. The French have scored a diplomatic coup by reversing the order of proceedings in such summits. Beginning with the tumultuous Earth Summit in Rio de Janeiro in 1992, national leaders arrive at the end of the summit to ratify what negotiators have painstakingly thrashed out for months previously. In Paris, they are descending on the very first day on Monday, along with Prime Minister Narendra Modi, to announce a Paris accord, committing negotiators to a fait accompli. At a preparatory meeting in June, Laurent Fabius, the French foreign affairs and international development minister, promised that the host country wouldn’t pull a rabbit out of the hat. For sure, there are going to be no major surprises. The long and winding road from the abortive summit in Copenhagen in 2009 has been steadily downhill. What were earlier compulsory cuts in greenhouse gas emissions of industrial countries who signed the Kyoto Protocol -- the United States didn’t -- have now been made voluntary. The Intended Nationally Determined Contributions or INDCs by all countries, including the US, China and India, the world’s three biggest carbon dioxide emitters, will not succeed in preventing world temperatures from breaching the two degrees Celsius rise from pre-industrial levels which, scientists assert, will cause catastrophic impacts globally. Sunita Narain, who heads the Centre for Science and Environment in Delhi, is among many Indian commentators who have already predicted that Paris will be doomed to fail. There will be a deal, but the draft has so many ifs and buts that it won’t cut any ice. It will mean different things to different people, so everyone can go away from Paris feeling that there has been a consensus of sorts. But that consensus leads the world to nowhere. The accord will not be binding, as is being made clear by the US and other rich countries. However, it is likely that the procedures for reporting national voluntary commitments may be made compulsory. In the past, India and other countries have resisted such reviews under the scrutiny of international agencies. As the United Progessive Alliance’s Environment Minister, Jairam Ramesh, controversially and unilaterally agreed to submit India’s actions to such monitoring, causing a furore in Parliament. Norway has taken the lead with other Scandinavian countries in calling for a halt to the use of coal as the major form of energy in the years to come. But this won’t be possible in China and India where the per capita consumption of electricity is still low. As many as 300 million Indians don’t have access to electricity. Modi will announce his Solar Alliance at the summit on Monday, a shrewd move that showcases his government’s commitment to generating 175 gigawatt tonnes of clean energy by 2022, most of it from the sun. Senior journalist Darryl D’Monte will be filing his despatches from the Paris climate change summit exclusively for Rediff.com. How effective will be PM's high-powered team in Paris meet?